Opened in March 2010, the Peninsula Shanghai is located in a new complex on the north end of the Bund. It is the first new construction on the waterfront in several decades and one of the anchor projects under the Waitanyuan (外灘源) redevelopment scheme. The scheme seeks to facelift the northern stretch of the Bund called Waitanyuan, a 7.5 acre (300,000 square foot) parkland that was once the private garden of the former British consulate. The first phase of the redevelopment called the “Rockbund” (洛克外滩源) was completed in early 2010 along with the Peninsula, just in time for the Shanghai Expo. The Peninsula in Shanghai looks and feels just like the ones in Hong Kong and Tokyo. It reeks of money everywhere. 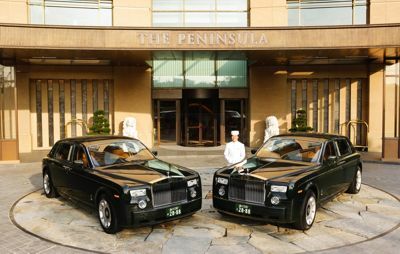 There is the same fleet of Brewster green Rolls Royce Phantoms parked near the entrance; the same army of greeters and porters donning those satin pillbox hats; and the same blinged out tai-tais having high tea at the lobby restaurant with their Hermès scarves and Chanel pocketbooks. Next to the hotel building is the Peninsula Residences, an exclusive collection of 39 serviced apartments for the super-rich. Arriving in a dusty taxi – a Volkawagen Jetta -- from the airport in my Uniqlo hoody, I suddenly felt like a hobo. That the Peninsula Shanghai is barely two years old means that the rooms are new, squeaky clean and very livable. 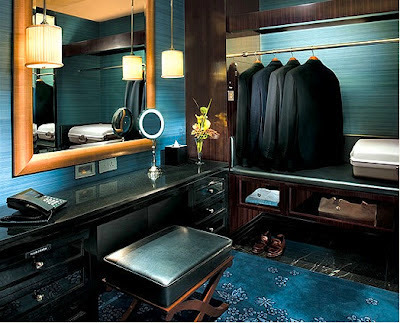 Each room has an impressive walk-in closet bigger than a typical bedroom in Hong Kong. The art deco furnishings work well with the noble blue and olive green palette and add to the interior’s overall modern chic. My room has a partial river view, and the floor-to-ceiling window floods the entire room with sunlight. By the time I walked in to the room, a complimentary fruit platter and a personalized welcome message awaited me on the coffee table. At the Peninsula Shanghai, it seems that even a hobo gets treated like royalty. I spent two nights at the hotel and I had nothing to complain about; everything was satisfactory. And that's precisely what the Peninsula Shanghai felt like: satisfactory. I wasn’t blown away. What I found remarkable about the hotel – and it appears to be the case for other five-stars hotels in Shanghai – is the diversity of the hotel staff. You will run into a Japanese waiter at breakfast, a Swiss manager at the concierge and a Russian personal trainer at the gym. The Peninsula Shanghai is a testament to a city’s international panache and the ability of modern China to lure talents from around the world. Remarkable indeed. Hey we did it! Give it higher rate for architecture! You did! Wow, I am impressed!!! I was going to comment on how understated the buildings are -- which must have been a tough idea to sell to the Mainlanders. The 'architecture' scores zero - this is construction.